WHEN IS A PAINTING not a painting anymore? 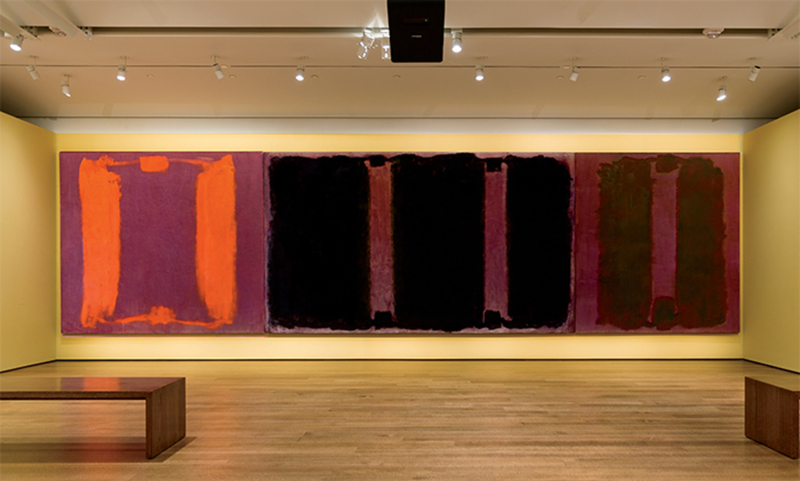 In 1962, Mark Rothko created the Harvard Murals, a set of six monumental paintings, five of which were displayed in the penthouse dining room of the university’s Holyoke Center, a windowed perch with stunning views. Deeply and delicately hued expanses, the canvases ranged in color from searing orange-red to light pink to dark purple. But in the decade that followed, continual exposure to daylight drastically changed the works, fading them so that some areas lightened to near white while others turned a dull black. Languishing in storage for many years, the works were thought to be beyond repair. But recently, a team of conservators and scientists made a new and unprecedented attempt to restore the picturesnot with pigment or chemicals but with light: For each canvas, they devised a highly complex colored-light projection that, when shone on the work, returns it to its original coloration. What we see is what was meant to be seen, ostensibly. But what are the risks of such an approach? Does the use of light open the door to virtual reality, to smoke and mirrors, turning the paintings into something else altogether? Or does it constitute a brilliant way of making the paintings viewable again, without so much as touching a thread of canvas? Conservator CAROL MANCUSI-UNGARO, who worked on the project; curators HARRY COOPER and JEFFREY WEISS; art historian YVE-ALAIN BOIS; Artforum editor MICHELLE KUO; and artists LYNN HERSHMAN LEESON, DAVID REED, KEN OKIISHI, and R. H. QUAYTMAN peer into the void. CAROL MANCUSI-UNGARO: Rothko’s Harvard Murals were installed in 1964, but after suffering differential damage, they were put in storage in 1979. They were included in a few exhibitions, two at Harvard and one traveling exhibition, but basically they hadn’t been seen or studied for decades. 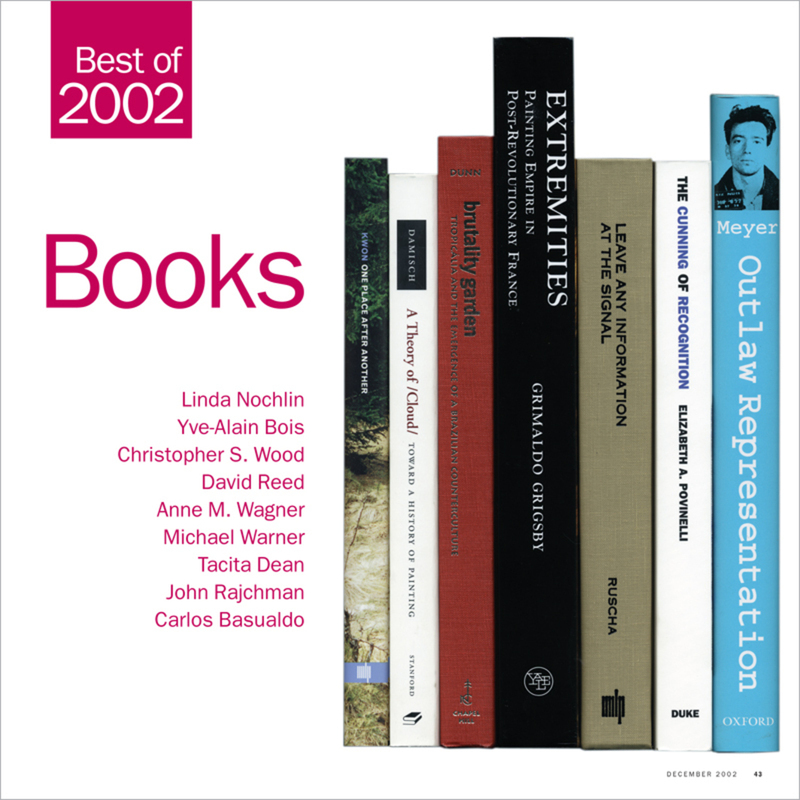 To take stock of the past year, Artforum contacted an international group of artists to find out which exhibitions were, in their eyes, the very best of 2007. Contributions by ten of those artists have been reproduced below. 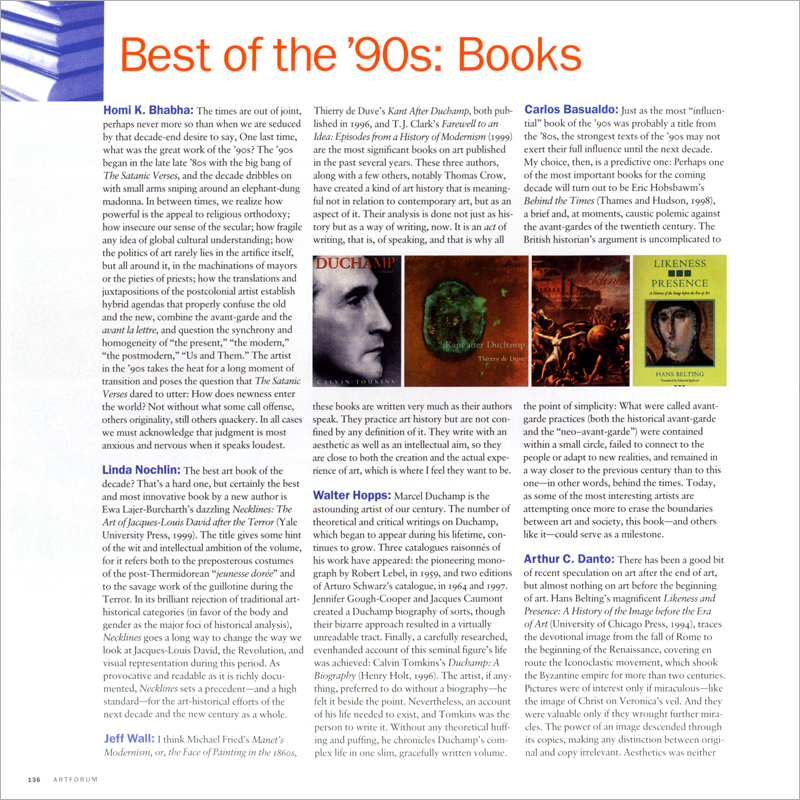 For the rest, see the December issue of Artforum. Few funerals have been as indecorous as the one held for painting in the early ’80s. Was the deceased truly dead, and, if so, in whose name could the death certificate be signed? Or was this a burial without a corpse, another instance of the ritual interments that seemed to recur throughout the nineteenth and twentieth centuries, as Arthur C. Danto suggests in his keynote statement? Artforum convened the roundtable that follows to offer our own reexamination of the Death of Painting debate and its legacy throughout the decade. In the April issue, a second group led by Robert Storr considers the afterlife of painting in the ’80s and beyond. LEE LOZANO ISN'T EXACTLY A HOUSEHOLD NAME—even in art houses. But in the 1960s and early ’70s, she was very much part of New York’s art scene; she knew everyone and is remembered as an intense and engaging figure (her inamorati included such diversely talented men as Dan Graham and Joey Ramone). To say the least, Lozano had a strange—and brief—career; though lasting just over a decade, it encompassed a series of distinct styles and practices. 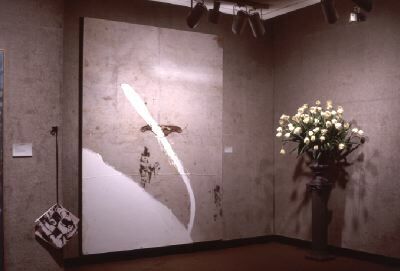 For several years, she exhibited regularly, including group shows at Richard Bellamy’s Green Gallery in 1964 and 1965. Later she distanced herself from the art world before finally dropping out altogether. Lozano, born Lenore Knaster, attended the Art Institute of Chicago in the ’50s (where she met her future husband, Adrian Lozano) and began her career in the early ’60s making cartoonish, overtly sexual paintings and drawings, not unlike the hand-painted Pop of Peter Saul, early Claes Oldenburg, or the late efforts of Philip Guston. By the mid-’60s, her imagery became more abstract, more formal and hard-edged, as in her monumental “tool” paintings, which depicted screws, pipes, and wrenches mostly in somber grays. Despite the industrial cruelty of these works, the humor and sexuality of the earlier efforts persisted. Lozano’s next body of paintings consisted of completely abstract works that interrogated painting’s basic elements. Drab browns, oranges, and smoky purples covered shaped canvases—often several were assembled to form a single painting—which may have been slashed or perforated with cut-out shapes. One exhibition of these works was reportedly held in a dark room; viewers were given flashlights to move across the canvases, allowing them only slowly to piece the paintings together. The most critically recognized late paintings were the eleven canvases comprising the “Wave” series, 1967–70, in which Lozano painted wavelengths of light multiplying exponentially. Like her other work of the period, these canvases incorporated duration as well as a pictorial space that expanded to include both viewer and artist. 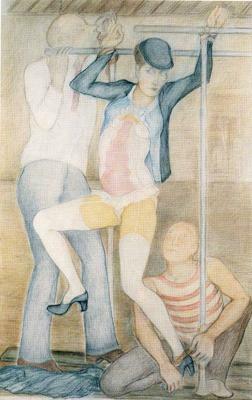 For a last series, planned but never realized, Lozano wanted to make the same painting in various states: stoned, drunk, horny, etc.—not only summarizing the going passions of the day, but demonstrating her belief in completely intermingling art and self, despite the work’s apparent intellectual cool. Indeed these gestures point to, and share much with, the conceptual work for which Lozano is best known. They reveal her desire for painting that moved beyond the limits of the canvas, incorporating the viewer’s and the artist’s lives. In the late ’60s, Lozano began extending her art to include various activities in her studio-loft, interactions with friends and colleagues, and experiments with her relationship first to the art world and then beyond. For Real Money Piece, 1969, she invited people to either contribute money to or remove it from a glass jar, noting their response (“Larry” Weiner took a dollar; Brice Marden laughed and said he didn’t need any). Some of the pieces were instructions for solitary actions, such as Throwing Up Piece, 1969, in which Lozano threw the twelve most recent issues of Artforum in the air. Other important works expressed her increasing disillusionment and alienation from the art world. Perhaps most famously, Lozano decided to stop speaking to women for a month, as an artwork—an action that continued for almost three decades, until her death in 1999. She had long since left the art world, first for New York’s budding downtown music scene, and eventually for Texas, her final home. Very little is known about her life after the early ’70s. Recently, I talked about Lozano with the painter David Reed, who has been interested in her art since the late ’60s. 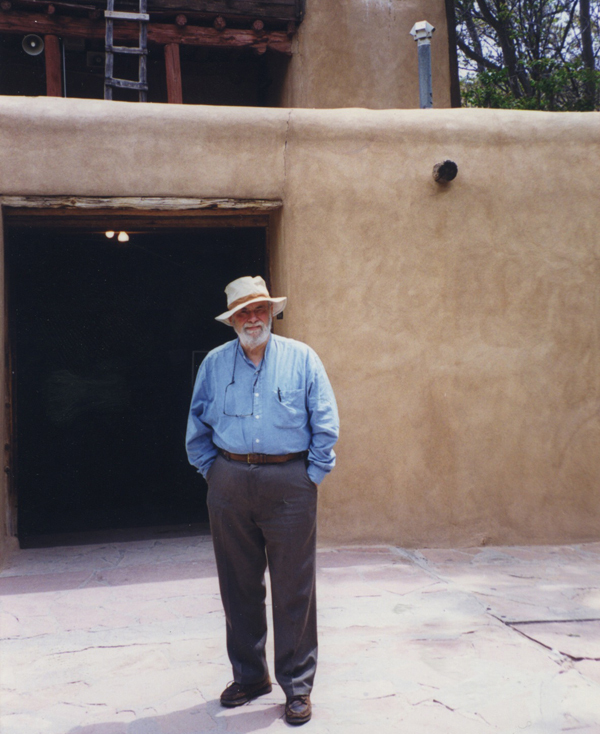 This past year, an invitation from the Blanton Museum at the University of Texas, Austin, to study a group of paintings bought with Richard Bellamy’s advice (including Lozano’s Ream, 1964) afforded Reed the opportunity to think seriously about her work and the historical context that gave rise to it. This summer, he accompanied me on a visit to Chelsea gallerist Jaap van Liere’s barn-studio in Pennsylvania, where much of Lozano’s art is stored. Reed’s own work plays with our peripheral vision as well as our sense of time—both central to the “Wave” paintings he loves. He also sees Lozano, in her restless relationship to the medium and in her conceptual experimentation, as both a model and, in her disabling anxiety, a cautionary tale. As such, her multifaceted practice is a decisive link in the secret history of avant-garde painting that has persisted in the wake of the endgame strategies of the ’60s. KATY SIEGEL: How did you first encounter Lee Lozano?